It's like digital geocaching with a Nintendo sheen—which yes, really is quite cool. Pokémon and its “Gotta catch ‘em all” mantra have enraptured fans on Nintendo’s handheld systems for 20 years now, but only match-three puzzle and collectible card game spinoffs have made their way to iOS devices. While the next big Pokémon game for iPhone isn’t exactly a translation of the classic monster-battling adventure, it might be an even better fit for a connected device you keep in your pocket all day. 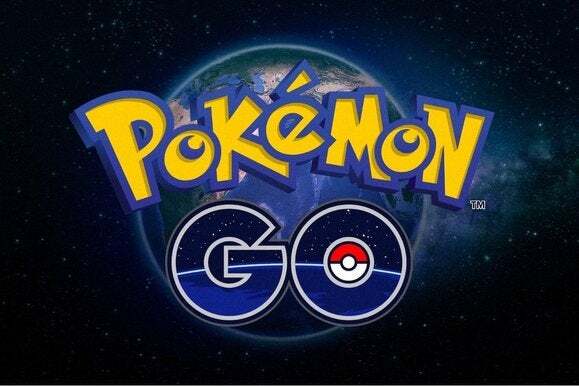 Due out in July, Pokémon Go hails from Niantic Labs, the formerly Google-owned company that designed the location-based mobile favorite, Ingress. Unsurprisingly, the two games draw from the same playbook in many ways. Like Ingress, Pokémon Go is designed to send you out and about into the real world around you, visiting nearby locations and perhaps venturing wider out in search of digital Pokémon to collect and battle. It maintains the spirit of the series while taking on a distinct new form, and after playing the beta version for the last few days, I’m convinced Pokémon Go will be a new kind of on-the-go obsession for the Poké-faithful—so long as you’re not expecting a game you can binge-play on the couch. It’s your city, albeit reborn as a Pokémon world and littered with the creatures and other hotspots. Fire up Pokémon Go for the first time and you’re asked to lightly customize your own avatar, which has a more realistic build than the anime-esque heroes of the main games and previous adaptations. That shift doesn’t apply to the Pokémon themselves, however, as the 500 featured monsters all have that same charming, cartoonish look as in other Pokémon media. And they’re everywhere—all around your city, really. 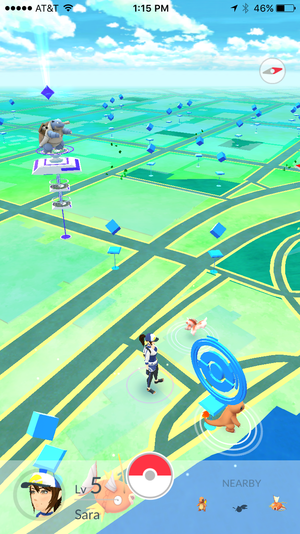 Pokémon Go pops your character atop a Google Maps-style grid of your surroundings, where your streets and avenues become paths to follow in the Pokémon universe. If you don’t see any of the creatures in your immediate vicinity, start walking in any direction. Before long, a Pidgey, Snorlax, Weedle, or something else entirely should pop into view, sending a vibration to your phone if the app is open. 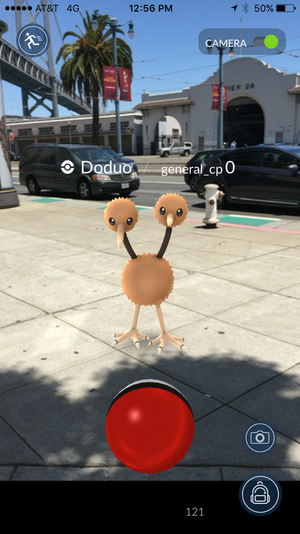 Once the creature is engaged, Pokémon Go pulls a delightful augmented reality trick and puts a 3D model of the monster into your real-life surroundings, thanks to your iPhone’s back camera. As you point your phone its way, you’ll need to fling Poké Balls to try and capture the Pokémon, although a direct hit isn’t a guaranteed get: sometimes the monster will fight its way out. More powerful balls are also available, albeit in limited supplies. It’s coming right for you! Filling up your Pokédex isn’t the only thing to do in the world, however: there are loads of little real-world stops worth visiting. For example, in my Chicago neighborhood, I can walk a couple blocks and visit in-game stops at a nearby mural, a church statue, or a local movie theater. And when you get close to each, you can spin the photo emblem to unlock free items, including Poké Balls and power-ups. That incentivizes your wandering and makes it worthwhile to take a walk to stock up. And then there are the gyms. Inspired by the boss locales from the handheld quests, these hotspots on the map are where you’ll find actual combat as your Pokémon battles it out against the Pokémon of the current leader. Much like a mayorship in Foursquare, you’ll want to try and claim as many of these as possible for bragging rights—although you may need to put some serious time into the game if you want to have a shot against die-hard players. My Pokémon were crushed by a high-level gym leader’s monster on my first attempt; clearly someone who has been playing the beta for months. But then I found a nearby gym at a closed comic book shop down the street and handily won two battles in a row, wresting control away from the red team. Now my Squirtle will patrol that spot and try to fend off any new challengers that try to steal the throne from me and team blue. 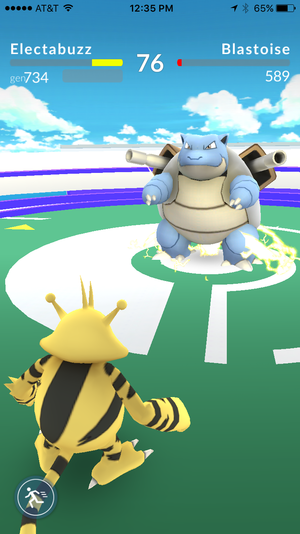 Battle it out for control of your nearby gyms. Without a storyline or traditional campaign progression, Pokémon Go can feel a little sparse compared to the classic games—especially if you’re trying to play inside your home. There’s little you can do from a stationary position, unless your house or apartment is mere feet away from an in-game gym, so it’s not the kind of game you’ll spend hours playing at a time. Well, at least not in one position. That said, so far it’s a very cool riff on the classic Pokémon theme, and it makes a lot of sense for a GPS-connected device. It feels like you’re geocaching, only without the aimless wandering and search for clues: Whether or not you’ll encounter Pokémon is the only real question, as well as whether the ones you find are the ones you really want. It’s unclear whether you’ll be able to get a large number of the entire roster in your city or state; so far, I’ve seen a lot of the same Pokémon wandering my area, although catching multiples does let you evolve your Pokémon. Keeping my iPhone open to play is a bit cumbersome, needing to dart my eyes between the screen and my very real and potentially dangerous surroundings, and it invites strange looks from bystanders. On a Pokémon hunt with my three-year-old son, I noticed a couple looking at us very curiously as we tried to hurl digital Poké Balls at a Zubat. My kid is a bit too young to fully grasp the Pokémon Go experience; he continually looks behind the phone when I show him a Pokémon in the game, and keeps asking me if Pikachu is walking down the sidewalk. But Pokémon Go seems like it will be an especially big hit with slightly older kids and teens that have loads of time to go exploring with this digital guidebook. Niantic’s games and apps have that specific charm to them, immersing you in the virtual while ultimately exposing you to more of your surroundings, and it’s a big hook here. Pokémon Go Plus: worth the $35 to stay connected even without your phone? 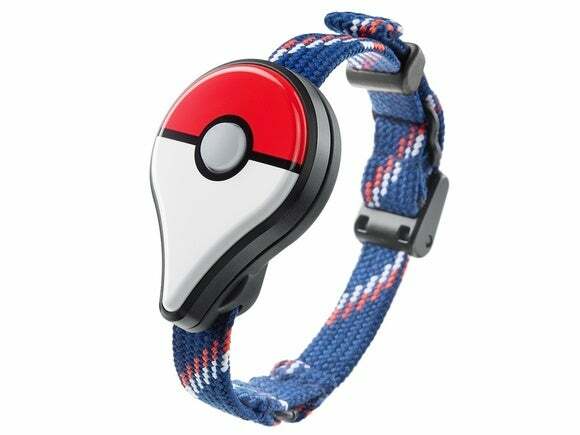 And serious Pokémon Masters have another option: The Pokémon Go Plus wearable device, which will also be available next month. The small Bluetooth-connected emblem, which looks like a GPS teardrop merged with a Poké Ball, can be worn around your wrist or clipped to clothing. When walking around without your phone (or with the app closed), you’ll be able to catch Pokémon and collect items just by tapping the button when in range, which helps you make progress without really paying attention. At $35, however, it’s a premium add-on. I imagine most people will simply opt to enjoy the free-to-play game as-is when it gets released next month on iOS and Android, although I’m looking forward to testing it with and without the Plus gadget for a follow-up article. For now, Pokémon Go seems pretty promising: It’s a colorful and fun representation of the Pokémon universe that transforms its core conceit into something new, social, and even physical. So long as in-app purchases don’t sour the competitive balance with gyms, it should be a great on-the-go experience for fans old and new.